Jenny's allegiance lay with the Confederate Army. But her heart belonged to the enemy. 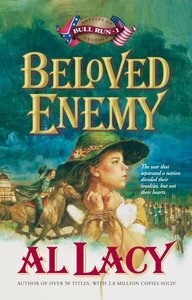 Faithful to her family and the land of her birth, young Jenny Jordan covers for her father's Confederate spy missions. But as she grows closer to handsome Union soldier Buck Brownell. Jenny finds herself torn between devotion to the South and her feelings for the man she is forbidden to love. Overwhelmed by pressure to assist the South, Jenny agrees to carry critical information over enemy lines. But when she is caught in Buck Brownell's territory, will he follow orders to execute the beautiful spy or find a way to save his Beloved Enemy? About "Beloved Enemy (#03 in Battles Of Destiny Series)"